You might think you saw it all when it comes to hotels and design and atmosphere inventiveness, but The Thief Hotel in Oslo might beg to differ. The 117 room hotel just launched the Apparatjik Suite, one that breaks many rules in terms of creativity. The art- and music-collective in Apparatjik consists of Coldplay’s bass player Guy Berryman, a-ha member Magne Furuholmen, Mew-singer/guitarist Jonas Bjerre, and Grammy winning music-producer Martin Terefe. But that’s not all! The main “ingredient” of this room is that you can actually sleep with your favorite rock star! 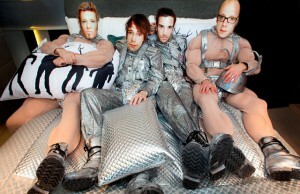 You can choose a projected version of your favorite Apparatjik member sleeping next to you on the bed. “I think we have injected an ambiance of the unexpected into the room. We wanted to tweak the existing design into something that make guest’s smile and shake their heads in disbelief at the same time. We believe disbelief is an underrated state of mind. One common denominator of all four founders of Apparatjik is that we have spent a disproportionately large part of our lives in hotel rooms. We believe it is not a hallmark achievement for a hotel that every room looks exactly the same”, explains Magne Furuholmen. And if you still have questions, here is an official video that will shed more light on this new and inventive suite! Apparatjik World from THE THIEF on Vimeo. What an awesome hotel. I love places with a twist! Good day! I simply would like to give a huge thumbs up for the good data you’ve got here on this post. I shall be coming again to your blog for more soon. There are actually loads of particulars like that to take into consideration. That could be a nice level to carry up. I supply the ideas above as basic inspiration however clearly there are questions just like the one you carry up the place a very powerful factor will likely be working in trustworthy good faith. I don?t know if best practices have emerged round issues like that, but I’m sure that your job is clearly recognized as a good game. Each boys and girls feel the influence of only a second’s pleasure, for the rest of their lives. I’m impressed, I need to say. Actually rarely do I encounter a blog that’s each educative and entertaining, and let me let you know, you’ve hit the nail on the head. Your concept is outstanding; the issue is something that not sufficient people are speaking intelligently about. I am very blissful that I stumbled throughout this in my search for one thing referring to this. Once I originally commented I clicked the -Notify me when new comments are added- checkbox and now every time a remark is added I get 4 emails with the same comment. Is there any method you’ll be able to take away me from that service? Thanks! Can I just say what a reduction to find somebody who truly knows what theyre speaking about on the internet. You undoubtedly know learn how to carry an issue to mild and make it important. More people must learn this and understand this facet of the story. I cant consider youre no more fashionable since you undoubtedly have the gift. This is the proper blog for anyone who needs to seek out out about this topic. You realize a lot its nearly arduous to argue with you (not that I really would want…HaHa). You positively put a new spin on a topic thats been written about for years. Great stuff, just nice! I’d should test with you here. Which isn’t one thing I often do! I enjoy studying a post that may make people think. Additionally, thanks for allowing me to comment! I used to be very pleased to find this web-site.I wanted to thanks in your time for this wonderful read!! I definitely enjoying every little little bit of it and I have you bookmarked to take a look at new stuff you blog post. I’m impressed, I must say. Really rarely do I encounter a blog that’s each educative and entertaining, and let me let you know, you’ve hit the nail on the head. Your concept is outstanding; the difficulty is something that not sufficient persons are talking intelligently about. I am very happy that I stumbled across this in my seek for something referring to this. Aw, this was a very nice post. In idea I would like to put in writing like this moreover – taking time and actual effort to make an excellent article… however what can I say… I procrastinate alot and under no circumstances seem to get something done. You made some decent points there. I looked on the web for the problem and found most individuals will go together with together with your website. A powerful share, I just given this onto a colleague who was doing a little evaluation on this. And he in actual fact bought me breakfast because I discovered it for him.. smile. So let me reword that: Thnx for the treat! However yeah Thnkx for spending the time to discuss this, I really feel strongly about it and love reading extra on this topic. If potential, as you grow to be expertise, would you thoughts updating your weblog with extra particulars? It’s extremely helpful for me. Massive thumb up for this blog publish! After research a few of the blog posts in your website now, and I truly like your way of blogging. I bookmarked it to my bookmark web site list and might be checking again soon. Pls take a look at my web page as effectively and let me know what you think. I’m impressed, I must say. Really not often do I encounter a weblog that’s both educative and entertaining, and let me inform you, you’ve hit the nail on the head. Your thought is excellent; the issue is one thing that not enough individuals are speaking intelligently about. I’m very blissful that I stumbled across this in my seek for something relating to this.